Photo by Max Herman. Courtesy the artist and Nasher Sculpture Center. 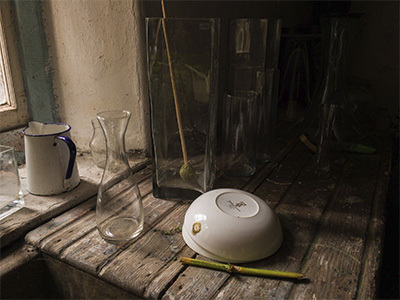 Luke Fowler, Installation View, Lismore Castle Arts, Lismore, Ireland, 2017. Courtesy the artist and Nasher Sculpture Center. Glasgow-based artist and filmmaker Luke Fowler aims to convey information through atmospheric means, layering affect and meaning in a highly evocative manner. 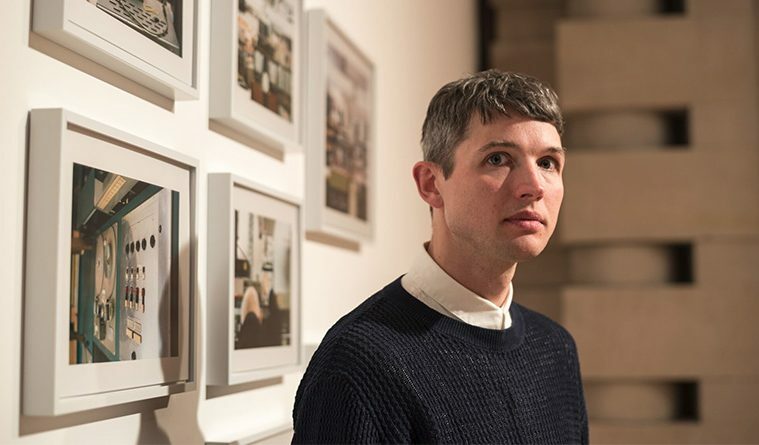 His film and sound-based collages, which earned him a Turner-prize nomination, are based on his esoteric interests and deeply concerned with atmosphere and how the effect captured in one medium can be conveyed through another. 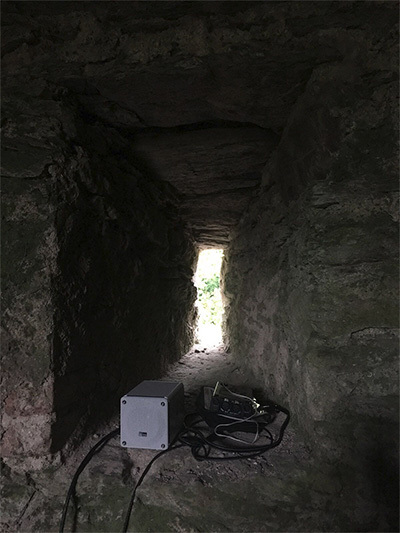 Gone Reflections (Part 2), part of the Nasher Sculpture Center’s Sightings series, is a joint commission between the Nasher and Lismore Castle Arts in Ireland, where the first part was installed inside a medieval tower on the site for several months in 2017. 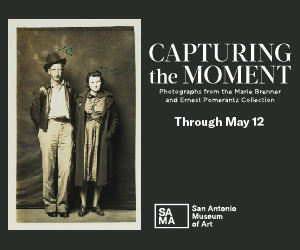 The second part will be installed in the Nasher Sculpture Center’s garden through Aug. 19. Orchestrating connection from the seemingly un-connected alongside a dedicated concern with atmosphere and context are through-lines in Fowler’s diverse work in performance, music, and film. Whether the pieces that comprise the work come from different people (the artist frequently works collaboratively,) or whether the process is more research-based, he is interested in changing an object or sound’s context while remaining sensitive to the ways in which the original contexts always and already effect everything that comes after. As part of his art practice, Fowler spends a great deal of time in archives, culling through documents, images, film and audio clips (often filming or recording his own), and compiling the pieces into documentary-esque films such as All Divided Selves, which takes as its subject the life of the experimental psychiatrist RD Laing who proposed radical notions of what constitutes sanity and insanity, or Pilgrimage from Scattered Points, about the English composer Cornelius Cardew who founded the Scratch Orchestra, an experimental group interested in subverting traditional conceptions of music and musical performance. For Gone Reflections (Part 2), Fowler essentially “recorded” two different sculptures in the museum’s collection, Naum Gabo’s Constructed Head No. 2 and Barnett Newman’s Here III. To capture and make audible the sculpture’s inherent sounds, he attached signal generators to each and set them to sweep sine waves between two frequencies. The results play from two sets of speakers in different locations in the Nasher garden: while one broadcasts the recordings of a sine wave travelling from a higher to a lower frequency, the opposing set plays the opposite, a descending wave. Over the course of a day, a number of different sine wave cycles intermingle in a continuously looping pattern. A sweeping sine wave isn’t a sound with which we are immediately familiar—they are most often used to gauge how an object or room is reacting to different frequencies or to test the tuning of a musical instrument. When installing the project, Fowler was careful to be sensitive to the other artworks in the garden as well as the entirety of sounds which compose a visit to the space—planes flying overhead, grackles squawking, the peaceful trickle of the fountain. What you hear depends on many factors such as where you stand and for how long. Fowler’s sound is just one among many. Some of the Gone Reflections (Part 2) sound cycles begin too high for humans to hear, some decrease to a pitch so low and loud and gravelly it imbues the Nasher’s otherwise tranquil garden with an atmosphere of dread. Most often though, you will just hear a sound you can’t quite locate—perhaps you’ll search for its source only to have it disappear as quickly as it surfaced.